Dockworkers in Norway who’ve been boycotting a terminal near Stavanger and launching sympathy strikes haven’t won much support in the media or among public servants. Now one top city politician in Oslo claims the labour conflict has gone too far. Hagen has never been known as a champion of the labour movement, but the dockers haven’t been getting much public support from labour-oriented politicians or even other labour organizers either. Many agree that the dockers’ insistence on maintaining their monopoly of vessel loading and unloading in Norway is old-fashioned and expensive, at a time when harbour operators and politicians around the country are trying to make harbours more efficient and transfer more cargo from Norway’s over-burdened roads to shipping along the coast. Hagen claims the harbour conflicts that are now spreading around the country are sabotaging political efforts to move more cargo to more environmentally friendly shipping routes. “We won’t get cargo from trucks and even trains over to sea transport, which is much better for the environment,” he told NRK. 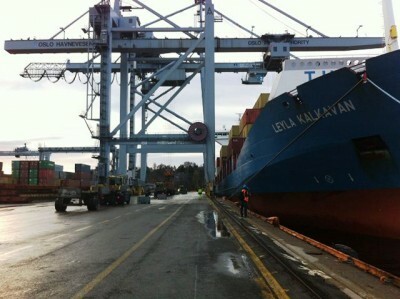 The long-simmering labour conflict between the dockers’ union, Norsk Transportarbeiderforbund (NTF), and harbour operators expanded over the weekend. The boycott at the Risavika terminal outside of Stavanger continues and now the harbours in Tromsø and Mosjøen have been taken out in sympathy strikes. In Oslo, vessels have been sailing before they’re fully loaded, because the dockers gather for what’s been called “the most expensive lunch breaks in the world” or simply haven’t done their jobs before the vessels’ scheduled sailing times. It all threatens cargo delivery during the busy holiday season and the dockers are unrelenting, blaming the disruptions on an unwillingness by the harbour operators to negotiate with them. “We have now boycotted the Risavika Terminal for more than a month, and the employer there still hasn’t shown any willingness to talk,” Roger Hansen of NTF told news bureau NTB on Sunday. “All we’ve heard is sabre-rattling.” Hansen says it thus may be necessary to expand their strikes again. The conflict stems from the Risavika operator’s refusal to sign a new agreement that will give the dockers in NTF rights to all work carried out at the harbour. That’s part of international agreements, stresses Hansen, who equated the harbour employer’s refusal to sign “a declaration of war.” He claims the harbours and terminals like Risavika want to use “underpaid foreign seafarers instead,” to help with the vessel loading and unloading, which he believes amounts to social dumping. Sande also notes that both LO and employers’ organization NHO have examined the situation at Risavika and concluded that Risavika is free to choose who can work there. LO Central, meanwhile, still favours NTF and is backing the sympathy strikes. Newspaper Aftenposten reporte that more than 90 percent of harbour users, questioned in a survey survey carried out for the harbour employers, believes that the dockers’ long-held right to load and unload containers, for example, is a problem for harbour efficiency. Hansen of NTF scoffed at the survey, and still blames the operators for failing to honour the dockers’ rights in international agreements. He described the situation as deadlocked.